We’re just a few weeks from Thanksgiving, and Christmas will be here before we know it. The holidays are such a fun time of year. They give us a reason to spend a little extra time with friends and family and indulge in amazing food. We are visiting my parents in Colorado this year for Thanksgiving, and Mom has already laid down the law – she is making the Turkey – her way! Enjoy the night off, Albertson’s on Broadway will do all the work for you. Visit them on Saturday, November 10th from 10 AM – 7 PM to preorder your meal (while supplies last). They have two main meal options available, plus additional holiday sides too! 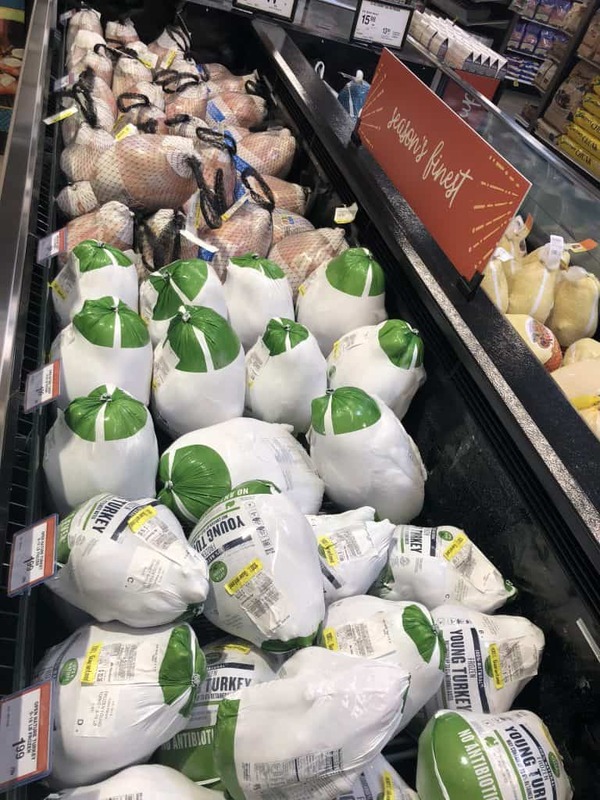 Plantation Turkey (fully cooked) 12 – 14 lbs. Cranberry Orange Relish 1 lb. Green Bean Casserole 2.5 lbs. SRF Kurobuta Half Ham Bone-In 8 lbs. Mashed Potatoes or Mashed Sweet Potatoes 3 lbs. Apricot Glazed Carrots 2 lbs. As you can see, holiday entertaining just got a lot easier! 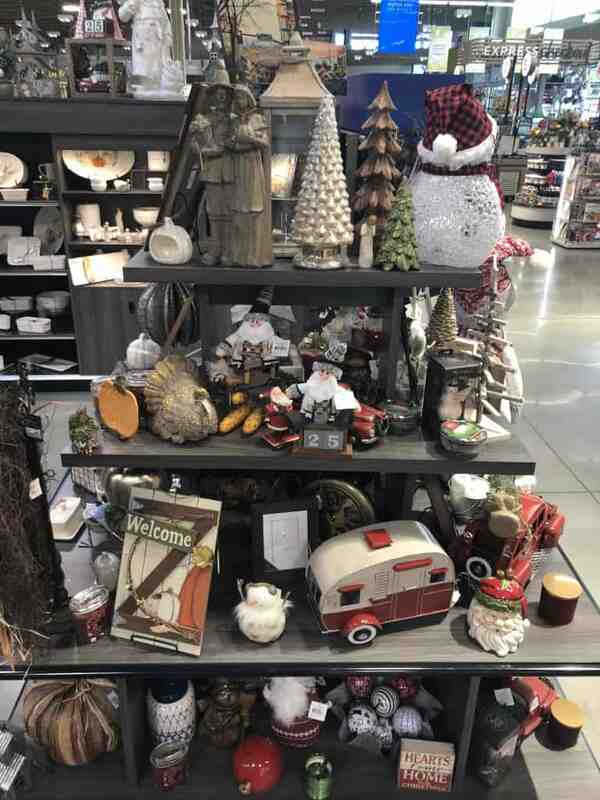 Albertsons on Broadway has everything you need to celebrate the holidays with catering options, beautiful centerpieces and lovely gift options (perfect for the host and hostess!). 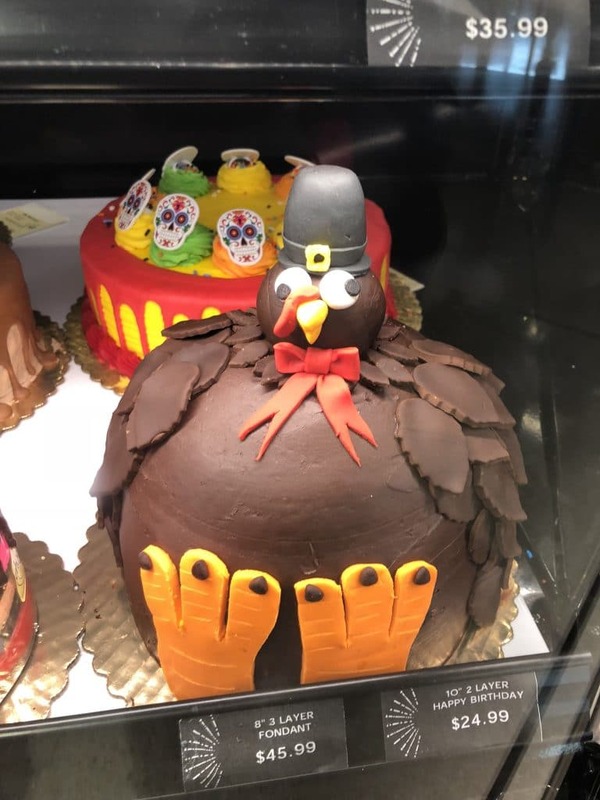 Albertson’s on Broadway has everything you need for the perfect holiday meal. This store never ceases to amaze me. They have so many great things you can buy in store… amazing cheese, the best meats, and desserts that are out of this world! 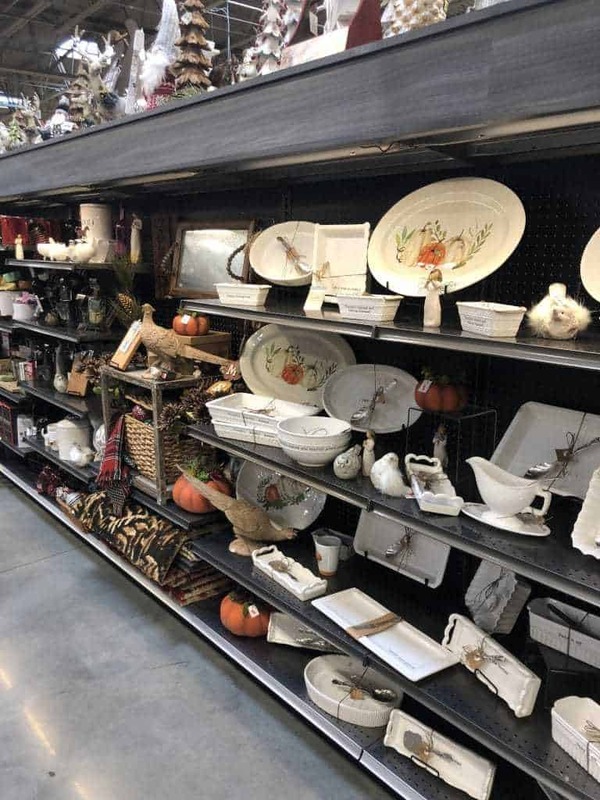 They have a great selection of holiday decorations and dishware too! 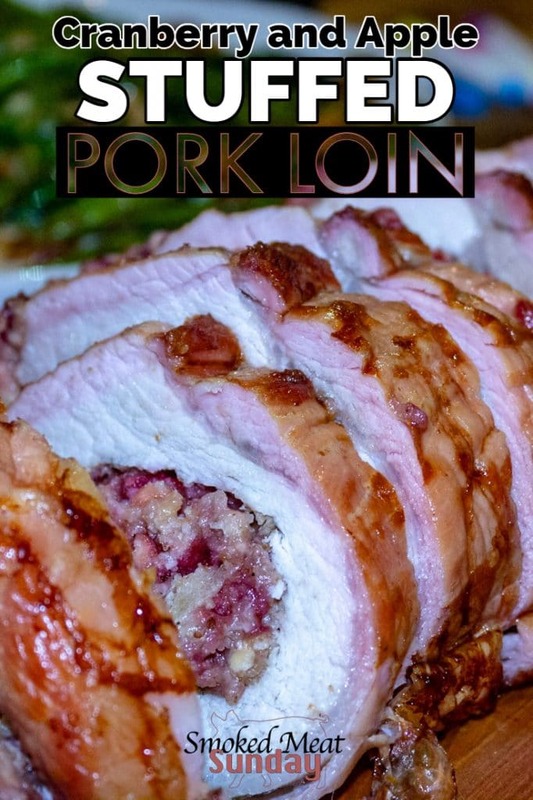 Turkey is always a good option for the holidays, but if you’re looking to switch it up this year, you might consider making this stuffed pork loin recipe. I really enjoy making smoked pork loin. It’s easy to prepare and the mild flavor of pork absorbs the flavors of herbs and spices really well. Pork Loin vs. Pork Tenderloin – What’s the Difference? I see it a lot, and I’ve talked about it before. Pork loin and pork tenderloin are NOT the same things. Pork loin is on the top of a pig’s back, next to the spine. It’s a lean cut of meat that is between 3 and 5 pounds. You can cut a pork loin into steaks and have an awesome meal. Pork tenderloin is in the same area of the pig but sits inside the rib cage. Pork tenderloins are usually 1 to 2 pounds, and much leaner than the loin. This recipe uses a pork loin. I wouldn’t recommend using this recipe to cook a pork tenderloin! 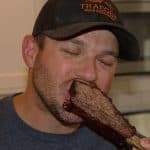 If you are looking for a great way to cook a pork tenderloin, check out this recipe. The hardest part of this stuffed pork loin recipe is unrolling or butterflying the meat. It might look intimidating, but it’s actually a really easy process. All you need is a long sharp knife and some patience. Lay the pork loin perpendicular to you on a cutting board, with the fat cap facing up. With the blade of your knife parallel and one inch above your cutting board make a cut in the pork loin. Slowly slice into the loin and pull the top away. As you make the small cuts the pork loin will “unroll”. Once the loin is flat on your cutting board cover it with a piece of plastic wrap. Using a meat mallet or rolling pin, flatten out the meat to make all of it as uniform thickness as possible. 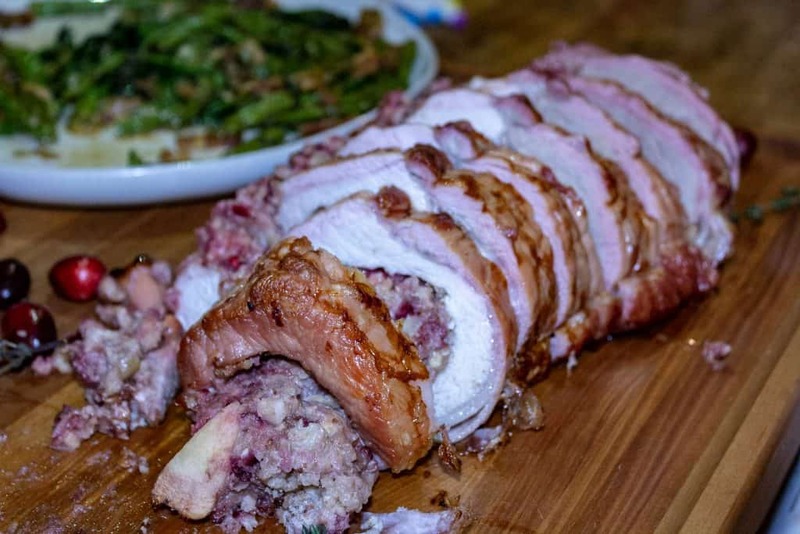 The stuffing for this stuffed pork loin recipe is simple. All you need is an apple, dried cranberries, bread crumbs, brown sugar, and butter. In a medium sized bowl combine 4 tbsp of softened butter, 1/3 cup of bread crumbs, and a 1/4 cup of brown sugar. Dice the apple, and add to the bowl, along with 1/3 cup of dried cranberries. Generously season both sides of your pork loin with salt and pepper. Flip the loin over to expose the cut open side of the loin. Place your apple/cranberry filling on the pork loin, and spread to cover all but 1/2 inch border all the way around. See the video above for reference. Roll the pork loin up tight but not so tight that it pushes the filling out. Secure with a few strands of butchers twine. 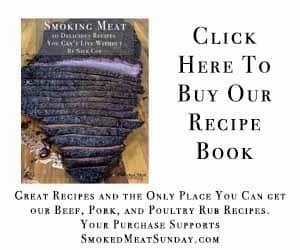 Get your smoker set up to cook at 300 degrees. I used Apple pellets for this recipe, but Oak or Cherry would work great too. Place the pork loin directly on the grill grates of your smoker, and let it cook until the internal temperature reaches 145 degrees. This should take about 90 minutes. Remove the pork loin once it gets up to temp, and let it rest in foil for fifteen minutes before removing the butcher’s twine, and slicing. 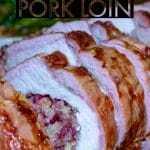 My family loved the flavor in this stuffed pork loin recipe. We served it with cooked spinach, asparagus, and hasselback style sweet potatoes. If you decide to make this, let me know how it turned out in the comments. Don’t forget to get all of your ingredients at Albertson’s on Broadway, and pick up a Caramelized Apple smothered Brie while you’re there too. If you're looking for a tasty alternative to turkey this holiday season, consider this Apple and Cranberry stuffed pork loin recipe. Lay the pork loin perpendicular to you on a cutting board. With the blade of your knife parallel and one inch above your cutting board make a cut in the pork loin. Slowly slice into the loin and pull the top away. As you make the small cuts the pork loin will "unroll". Generously season both sides of your pork loin with salt and pepper. Place your apple/cranberry filling on the pork loin, and spread to cover all but 1/2 inch border all the way around. Remove the pork loin once it gets up to temp, and let it rest in foil for fifteen minutes before removing the butcher's twine, and slicing.